The Hedge Fund Journal visited CCI Healthcare in Stamford, Connecticut (just next to the train station on the New Haven line), and met four of the seven investment professionals, as well as two people on the investor relations side. Senior managing director and portfolio manager, Oliver Marti, started his career at Morgan Stanley doing investment banking and equity research, covering healthcare, providers and hospitals. In 1997, he joined Pequot Capital as a senior analyst covering healthcare, where a formative influence was Marti’s boss, Teena Lerner (a PhD in molecular biology), who taught him about investing in therapeutic companies. In 2001, Columbus Circle Investors launched the healthcare long/short strategy, under Marti’s leadership, with roughly $5 million of partners’ capital. Columbus Circle Investors (CCI), an institutional money manager, began in 1975 and has over 40 years grown to 61 staff, with (as of 30 September 2015) approximately $15 billion invested across seven strategies, including about $1 billion in the CCI Healthcare strategy. CCI provides institutional infrastructure and resources that are invaluable for the CCI Healthcare team: including legal, compliance, risk analytics, data analytics, and strong access to sell-side research and corporate management. CCI Healthcare uses ‘best of breed’ service providers, with leading auditors and administrators, as well as prime brokers Deutsche Bank, Bank of America Merrill Lynch (BAML), and Goldman Sachs. CCI provides a supportive environment where the CCI Healthcare team has full investment autonomy. Marti’s team only runs long/short healthcare strategies, while the rest of CCI mainly runs long-only money, where the analysts are generalists covering multiple sectors; CCI has no dedicated long-only healthcare strategy. CCI also has two smaller long/short strategies focused on technology and international investments. Though all CCI analysts follow the same investment discipline, in the same office, all of the teams are unique and each strategy has its own portfolio manager and analysts. Hence, though analysts are encouraged to work collaboratively across the firm, each team is responsible for its own investment decisions (with no overlap of investment staff) as opposed to executing on decisions made by an over-arching chief investment officer. Decisions are made within the parameters of portfolio construction limits and with the oversight of compliance. The CCI Healthcare team’s longevity and cohesion is a source of pride for Marti. He argues that the experience and breadth of the team’s coverage distinguishes CCI Healthcare from other firms, such as biotech specialists, that are not covering the full spectrum of healthcare. Specialisation at CCI Healthcare occurs within the investment team (see Fig.1). CCI Healthcare aims to generate alpha from both longs and shorts in healthcare, and also tries to add value from tactical beta. Unlike some long/short managers, CCI Healthcare has sometimes gone net short and does actively vary net exposures. A Chartered Market Technician and CFA Charterholder, Hendricks looks at macro and technical factors, such as “the impact of oil and the US dollar on our marketplace and its potential impact on our investments.” Economic growth is sluggish, and may continue to be slow, but Hendricks does not see a US recession in the near term. He also closely monitors credit spreads, currencies and US policy decisions. On the technical front, Hendricks is well aware that biotech stocks became momentum stocks during the five-year bull run from 2010. “We realised that some stocks were at risk of a pull-back, so we put on a hedge in 2015,” he recalls. The hedge was carefully constructed, he stresses, as CCI Healthcare generally “wanted to avoid extreme short interest and takeover candidates,” so a bespoke basket was built. CCI Healthcare’s overall goal is to generate absolute performance, both long and short, though Marti points out that most of the opportunities historically have been on the long side given the strength of the healthcare sector. Marti observes “even the weaker stocks with poor fundamentals have appreciated, partly due to M&A and activism” during the past couple of years. CCI Healthcare has devised tools to reduce M&A risk on the short book, like building custom baskets of stocks, such as the biotech one used in 2015. CCI Healthcare judges merger activity on a case-by-case basis; the strategy has owned plenty of takeover targets, but this is not the primary reason for investing; nor does Marti automatically sell after a bid is announced. Marti also does not follow activist approaches engaging with company boards. In its bottom-up security selection, CCI Healthcare “first identifies companies undergoing change, where that change is not appreciated by investors,” says Marti. The concept of ‘momentum’ means different things to different investors. For CCI Healthcare’s stock-picking, momentum means neither share price momentum nor earnings momentum, but rather fundamental business momentum. “We aim to identify change that can be thematic or company-specific that leads, on the long side, to accelerating sales, improving gross margins and cash-flows and where investors do not realise the potential value,” states Marti. The EPS numbers are a by-product of the key drivers of the story, centred around change in a company’s products or services. The reverse dynamics apply to the short side. Castricone explains how CCI Healthcare is “looking for an element of surprise which is not simply EPS-focused, but based on key drivers of the investment.” The key qualities sought from longs and shorts are illustrated in Fig.2. Marti ultimately makes the investment decisions, but the whole team contributes long and short recommendations to an integrated portfolio; analysts do not run their own sleeves. Yet Marti has found that “because portfolio construction is generally fairly well balanced over the four major sub-sectors – biotech, medtech, pharma, and healthcare services – it contains inherent diversification that helps to lower volatility risk, and allows for cross-checking of fundamentals.” None of these four sub-sectors will go above 50%, and although biotech has punched above its weight in terms of performance, “the attribution has been fairly well balanced,” Marti reflects. Some 70% of holdings are US-based, with the balance elsewhere, but “there is a very high hurdle for emerging markets (EM) given the weak structure and oversight of those markets,” explains Marti, who generally prefers to play EM via developed market-listed companies with exposure there. In fact, he estimates CCI Healthcare at any given time can have roughly 15-20% EM exposure, via the revenue breakdown of those firms. CCI Healthcare has developed due diligence techniques that draw inferences from, and triangulate amongst, many data sets throughout the healthcare continuum, along with in-depth financial analysis, “including a much more granular breakdown of data,” Marti points out. Though the data is all public, these analyses allow for a better understanding of underlying drivers of growth and forecasts. Marti wants analysts to really understand the key drivers and he brings in outside modelling resources because he prefers his analysts to spend less time building models and more time doing research. Building the mosaic includes discussions with healthcare professionals, lawyers, and scientists, whether by attending medical meetings, listening to broker-sponsored doctor calls or the utilisation of expert networks. CCI Healthcare looks to “build a mosaic of public information drawn from companies, their competitors, financial documents, sell-side and buy-side contacts, and a range of experts to deepen our understanding of the marketplace,” according to Marti. 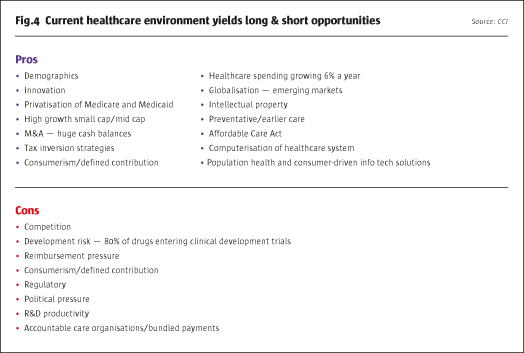 Marti views the healthcare sector as a rich source of alpha opportunities for several reasons. “Healthcare contains more market inefficiencies than other sectors, as it is very broad, complex and always undergoing change. This allows specialist experts to find opportunities through fundamental research,” he explains. Inparticular, idiosyncratic, or stock-specific risk, is much higher in healthcare than in other sectors, such as energy, where many stocks are driven by common macro factors and frequently move in lockstep. Fig.3 shows how CCI Healthcare sub-divides the industry into sub-sectors. This leads to a broad range of investment themes, driven by government policies, demographic factors and technological advances, as shown in Fig.4. Current demographics in particular are a significant driver of volume growth. Marti does not expect average life expectancy to hit 100 any time soon, but sees aging populations as a clear positive for healthcare spending because “those over 65 use three or four times as much healthcare products and services, and this is the fastest growing age group in the US today”. The team gave us insights into their thinking on a small selection of areas: Obamacare, payment models, behavioural health, genomics, bioinformatics, and biosimilars. However, a more complex and less-known aspect of the ACA is the new models of reimbursement for patient care. Government-funded Medicare is the second-largest payer behind the private health insurers, and with payment models evolving, CCI Healthcare is doing a lot of research in this area. Marti explains how “different payment models are being tested in the marketplace.” If hospitals are an obvious early winner from Obamacare, moving forward there are likely to also be losers, maybe even hospitals, due to the growth of ACOs (Accountable Care Organisations) and Bundled Care, which incentivise providers to provide care at the lowest cost. Marti foresees that “This will impact companies for many years, as business models will have to change.” Though Marti thinks that changing patterns of healthcare reimbursement will be a long-term process, he notes that the general move to lower costs is already occurring, as evidenced by “a shift to outpatient facilities and shifts to cheaper generic drugs.” The ACA also encourages more use of healthcare information technology, as “providers need data on best practices and population characteristics,” which Marti views as an exciting area of potential investment. “Even if the Republicans took over the White House, the Senate and the House of Representatives, a repeal is not a likely outcome because it would be politically very difficult to take healthcare away from 30 million people,” opines Castricone. More likely, he envisions, is that Republicans would have to offer a replacement plan that continues or even expands healthcare insurance, though with a different set of policies. Marti currently sees a number of broad themes with wide-ranging implications in both CNS therapeutics and behavioural care. He explains: “Disease of the brain covers different categories of investment, such as dementia, Alzheimer’s, depression, schizophrenia, cognitive impairment and substance abuse.” According to Marti, efforts in Alzheimer’s have gained much attention, as it should, though pharmaceutical and biotechnology efforts have had bumps along the way. “There are several drugs that have potential to make it to the market later this decade, but efficacy being modest, these are not cures,” he says. More research, understanding, and funding is needed. In addition, Marti notes a heightened level of US government concern regarding behavioural issues associated with those carrying out some of the horrific shootings in the US in the past couple of years. As a result, there is a sense of urgency to pass regulations that would provide greater access. This would benefit several companies that provide services to those in need. Andrew Oberwager explains that personalised medicine tries to identify “who will and will not respond to treatment, and then apply the treatment to fit the patient. This encourages more diagnostics, improves R&D productivity, and helps to justify pricing if value can be demonstrated for a patient.” Oberwager is also looking at gene therapy and new platform technologies. Given the amount of competition in the space, CCI Healthcare is focusing on identifying the technologies and companies that will emerge as winners. Today, generics make up over 90% of prescriptions, which is significantly higher than 10 years ago, when both doctors and patients were less certain on the effectiveness and side effects of generics. These same circumstances are now taking place with regard to biologics, whose patents are starting to expire and which are much more complex products versus small molecules. “Doctors and patients can decide if they use the branded biologic product or the biosimilar but they both need to get comfortable with biosimilars because very small changes in structure can lead to large side effects,” says Oberwager. “Unlike the generic chemical market, where prices for generics often fall 90%-plus, the price difference between branded biologics and biosimilars will be much smaller, with biosimilars costing maybe 30% less.” Notwithstanding some approvals in Europe, the whole space is nascent, as patent litigation between branded and biosimilar manufacturers has yet to set any precedent, so Oberwager admits “it is still not clear how patent litigation with regard to biologics will play out.” Still, he does have some degree of confidence that the complexity of biologic molecules tends to make biotech patents stronger than pharma ones. Marti manages two healthcare long/short strategies: a flagship diversified, “all weather” strategy, and a more concentrated strategy aiming for higher returns, though with higher risk, investing in smaller and less liquid healthcare companies, but no private equity or pre-IPO. The flagship diversified strategy operates in a variety of formats, including a UCITS structure on the Bank of America Merrill Lynch (BAML) platform. “We are very focused on our partnership with clients and try to offer a high level of transparency,” Marti states. The regulations governing UCITS diversification criteria, such as the 5/10/40 rule, are not a problem because the flagship CCI Healthcare strategy already has general guidelines within these parameters, such as having a position size cap of around 5%. All vehicles in the flagship strategy, including the UCITS product, are run pari passu. There are no plans to launch a ’40 Act mutual fund for the US market as “it does not make business sense for us,” says Marti. The concentrated strategy doubles all of the risk constraints applying to the flagship. In general though, the strategy does not invest in stocks with a market cap below $100 million, nor does it invest via the OTC bulletin board; the investments tend to be smaller in cap size with lower levels of liquidity. 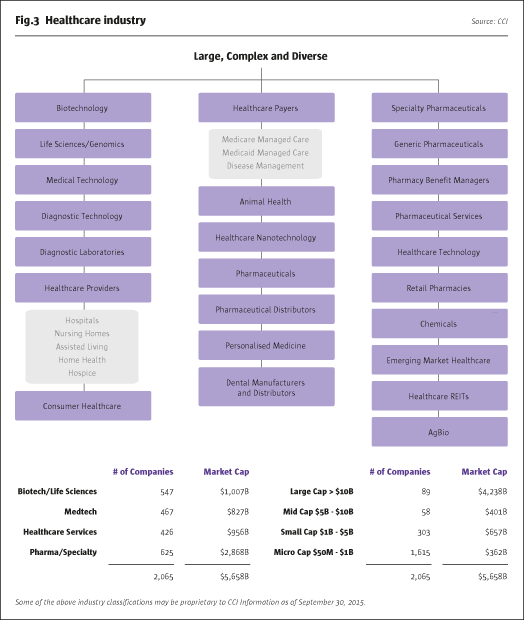 The concentrated strategy, which began in 2013, “leverages knowledge from work that was already being done in running the main strategy,” says Marti, “in a vehicle for clients that desire that risk profile.” CCI Healthcare typically owns stocks for extended periods, but will trade around positions to take advantage of volatility. Holding periods may be shorter for the concentrated strategy, as it takes views on events such as clinical trials and FDA approvals, often within a three-month time horizon. CCI Healthcare sees $1.5 billion of capacity for the diversified strategy, and just $200 million for the concentrated strategy. This is based not only on daily volume data, but also on the team’s capacity to find new ideas. For both healthcare strategies, aside from what Marti believes is one of the most experienced teams in the field, CCI Healthcare differentiators include the investment discipline; the infrastructure of CCI; proprietary analytical tools; the ability to run flexible net exposures; the broad sub-sector focus; and analysis of macro and technical inputs, all of which have helped contribute to the strategies’ historical performance. “We have been fortunate to have what we believe is one of the longest track records in healthcare investing,” says Marti. PULLOUT: Drug pricing panic overblown? In response to stories of huge drug price increases of up to 5,000%, drug companies are being subpoenaed to appear before Congressional hearings. But Marti thinks that investors may be paying too much attention to fears over drug price controls proposed by Presidential candidates such as Bernie Sanders and Hillary Clinton, whose now infamous tweet sent shockwaves through the sector. First, Marti thinks the media portrayal of the debate is not necessarily the reality. “There are certainly unjustified price increases that we believe are unacceptable. Aside from these cases, there is a lot that goes into drug pricing, such as rebates, co-pays, patient assistance, and charge-backs, so the headline price is not what a company gets.” An educational barrier needs to be overcome to convey the complexity of drug pricing to the public; indeed some CEOs of drug companies have recently called for more transparency on the issue. Secondly, he argues that some of the most expensive new drugs are vastly superior to their predecessors. For instance, a new treatment for Hepatitis C costs around $75,000 and cures 95% of patients within a few months, with limited side effects, whereas previous treatments could imply a total cost of care of $200,000 whilstonly curing 50% of patients and having significant side effects. The social benefits of the new treatment are even greater as the negative externality of transmission is also reduced. Thirdly, “major changes to how drugs are reimbursed would require a law acceptable to all parties in Washington,” and that is a big ask, thinks Marti. As Democrats have a more socialised bias, with government playing a bigger role in market dynamics, and Republicans are more biased towards market-based models, it is very difficult to pass legislation. Fourthly, Marti argues that “many new products face limited competition, especially in the areas of orphan drug diseases, and have high barriers to entry.” Finally, Marti points out that to bring one drug to market typically requires a billion dollars in R&D investment, and these costs and risks need to be compensated with a return on investment. This return on investment period is limited to the life of the patent; afterwards, the payors benefit significantly as the price of these medicines drops materially.